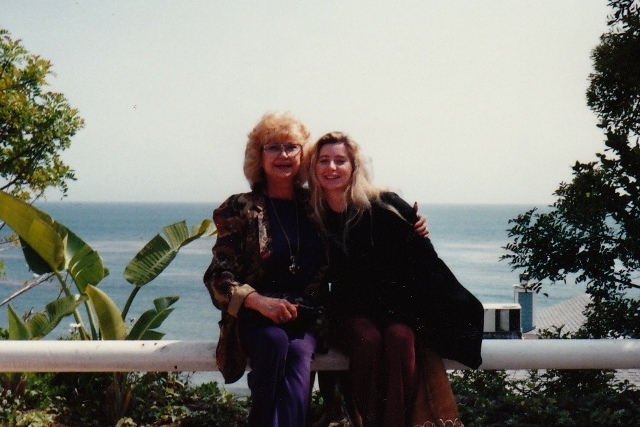 About Us | Joan Valentine - A Foundation for Natural Cures, Inc.
Joan Valentine (left) and daughter Dianne Burnett at Geoffrey's in Malibu on Mother's Day 2006. Joan Valentine was a remarkable mother, grandmother, wife and friend who always put everyone before herself. Unfortunately she didn’t treat her own body with the same compassion as she did those closest to her. She neglected her health and as a result was diagnosed with esophageal cancer in 2009. After her diagnosis she was given absolutely no hope of getting better and doctors told her to get her affairs in order. Joan went from being a person to being referred to as a number at what is considered one of country’s top cancer clinics. The negative attitude exhibited by her Western doctors infuriated me, especially when I suggested incorporating alternative treatments. They make you believe that the best way for your loved one to have a chance at survival is if you follow the standard of care. But I believed that integrative therapies would not only save her but allow her to live a life free of the sufferings many cancer patients who take the Western road experience following chemotherapy and radiation. I’ll never forget the day I took large tote bags of herbs and supplements to her oncologist, who wouldn’t allow her to take any of them. Getting my entire family onboard with integrative medicine was no easy task either. Nine months after my mother was diagnosed, she passed away. As I looked into my dying mother’s eyes for what was the last time I saw her alive, I promised to devote the rest of my life searching for a remedy to help cure cancer and to teach our young and old how to prevent this horrible illness. We need to educate ourselves about various methods to treat cancer and adapt a healthy lifestyle that may lessen our chance of becoming stricken with cancer. That is my mission with the Joan Valentine Foundation. People need to know there are other avenues besides traditional and mainstream medicine. I would still encourage everyone to see their general practitioners but seek out alternative means. After you have the information from Eastern and Western medicine then make an informed decision. We must make strides against this dreadful disease called cancer.